NYPD has filed misdemeanor charges against a cab driver who killed an Upper East Side pedestrian, marking the first time police have employed a new law that makes it a crime for drivers to strike pedestrians and cyclists who have the right of way, according to a report in DNAinfo. Silvia Gallo, 58, was in the crosswalk at E. 79th Street on the afternoon of August 29 when MD Hossain hit her while turning left from Madison Avenue. Gallo was dragged beneath the cab until Hossain came to a stop and witnesses overturned the vehicle, which was still running, to free her. She was pronounced dead at Lenox Hill Hospital. DNAinfo reports that Gallo, a Pilates instructor, was preparing to leave for Ireland the next day, to work and live with her boyfriend. Hossain’s hack license was suspended after the crash. Police initially said both the driver and the victim had the right of way — an impossible scenario, since the motorist would have been required to yield, but one that suggested Gallo was in the crosswalk with the walk signal. Available information indicated the driver could have been charged under Intro 238, now known as code Section 19-190, which took effect on August 22. The law was one of a number of new measures intended to reduce traffic deaths and injuries as part of the mayor’s Vision Zero initiative, but NYPD wasn’t yet ready to put it to use. Motorists have killed at least nine pedestrians and cyclists, including Gallo, since the law took effect. DNAinfo reports that police filed charges in Gallo’s death last week. After a month-long probe, the NYPD Collision Investigations Squad determined last Thursday that Hossain had violated the new law. He was arrested at his Bronx home and formally charged. Hossain, who has no previous criminal record, faces a $250 fine per offense and possible jail time under the new law, officials say. A misdemeanor charge is categorically more serious than a traffic violation. The offender is arrested, and then must appear in court and enter a plea. A plea of guilty or a conviction means a permanent, public criminal record. First-time misdemeanor offenders may not be sentenced to imprisonment, but it can happen. In contrast, common traffic offenses like “failure to yield” or “failure to use due care” … have in practice proven to mean fines and nothing more. As Vaccaro pointed out, under Section 19-190, police and prosecutors are not going to start systematically putting drivers away for hurting and killing people. Ideally, if NYPD applies the law as it should, the threat of a criminal record and the possibility of jail time will send a message to city motorists that traffic violence will be taken seriously, making streets safer for everyone. We will follow this case as it develops. It is still a problem if the NYPD is only using Intro 238 after the fact in crashes, while barely enforcing failure to yield, which could change driver behavior before they hit someone? It needs to be a balance of enforcing this law and also cracking down on reckless driving. But that they actually mounted an investigation and filed criminal charges is a huge step in the right direction. Ultimately, the drivers that cause deadly crashes, admittedly, aren’t intending to hurt anyone in most cases. But they also think they’re invincible and that they have the “skill” to drive the way they do and that it won’t hurt anyone and if it does happen, it was an “accident”. But if we send the message that you can be held accountable for an “accident”, that can help to change the perception overall. Of course, better lower-level enforcement is badly needed. The prospect of being ticketed has to be be greater than the prospect of hurting someone. Right now, that isn’t the case. i think there’s a social component of this issue that has failed to be widely addressed. That is that cars are large hunks of metal that can easily injure and kill; as such they must be operated with extreme caution around other living beings. We need to change the driving culture in NYC to one where speeding and reckless turning are unacceptable both legally AND socially. This might satiate the desire for vengence but will not make the streets safe. I think preventive medicine is certainly the best prescription, but there is some usefulness to punishment also. There is an attitude among drivers, sometimes verbalized, that in a collision only the pedestrian will suffer consequences. “Satiate the desire for vengeance”? It’s 30 days and a fine – max, mind you – for killing a person. Not exactly eye for an eye. Punishment for wrongdoing may be a new concept for reckless drivers, but it’s kind of an established thing otherwise. How do you know that? Mental telepathy? I have no idea what car drivers are thinking when they kill people by crushing them or poisoning them. Nor do I really care or believe that it makes the slightest difference. I have zero tolerance of car drivers crushing or poisoning people. Glad to see the law used. But I do hope 19-190 is not used just by the Collision Investigation Squad. A critical reason for criminalizing reckless driving was to take enforcement out from under the NYPD’s “observed violation rule,” so that ordinary precinct officers–not just CIS detectives working on the 10% most serious crash cases–could do enforcement. I think they know there is a chance of harm, but as long as someone else pays the price, the risk is acceptable to them. It is a kind of willful negligence. I think that most actions taken by motorists that result in death or injury to pedestrians are ‘safe’ in the sense that you could make the same maneuver a thousand times and only once would it result in even a minor physical injury. Working off of this…people generally aren’t great at judging risks like that. You’ll see some people get a bit more cautious if they are worried about getting a criminal record, sure, but no matter how draconian the punishment is (19-190 is not of course – wasn’t that the point of it?) if 999/1000 nobody is hurt and so there is no consequence for the driver you won’t do much to change behavior. And if you accept that there is an element of chance involved, entering blind turns and the like moving too quickly to be able to see, I’m not sure how fair it is to punish only the one who happened to strike a pedestrian, and not the overwhelming majority of drivers who made the same reckless maneuver. I think cameras that flash, offering a real time feedback to drivers, together with a modest fine of $25-50 per incident that gets even just 5-10% instead of 0.1% of drivers would do a lot more to make the streets safer. Do this too, not instead. Great that it was used, but now we need the other 99.999% of the police force to put it in their toolbox and pull it out when cars hit people w/ right of way. This needs to be a major culture change for dangerous driving even in cases where the car doesn’t kill. The last paragraph of your post just gave me a great idea. In lieu of fines, why not do something which makes drivers VERY uncomfortable when cameras detect dangerous driving? You can have a bright light start strobing, or maybe direct a very loud alarm sound towards the vehicle (and we can direct sound this way without disturbing everyone else). The idea here is conditioning drivers into proper behavior. I suppose fines do that to an extent, but it’s a really cumbersome way to do it. My way does it in real time. Traffic calming measures which make it nearly physically impossible to drive recklessly, like bollards between lanes near intersections, also work well. Some justice for Silvia Gallo’s case and family, yet still sad. With widespread automated enforcement for failure to yield, speeding, and red light running, it’s possible she’d still be with us and in Ireland right now, teaching health and wellness. Meanwhile we’d instead be reading an article about the rapidly decreasing number of injuries and deaths thanks to cameras and no thanks to NYPD. 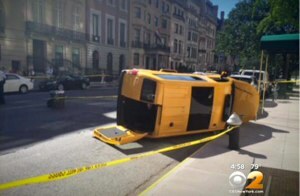 The cab driver who unsuccessfully challenged the constitutionality of the Right of Way Law after killing Manhattan pedestrian Silvia Gallo pled guilty to violating the law yesterday. Will NYPD Apply New Vision Zero Law to Cabbie Who Killed Woman on UES? Livery driver Buddhi Gurung, who killed 77-year-old Carol Dauplaise on the East Side, pled guilty after a judge ruled against him. It was the second time Manhattan DA Cy Vance successfully fended off a constitutional challenge to the city's Right of Way Law.